Our Roof & Gutter cleaning team undertook 2 weeks of commercial gutter cleaning works for a prestigious client in Reading, Berkshire. Many of the gutters were on listed buildings and much of the guttering has awkward access issues for our team to overcome. Our initial site survey concluded that the team would have access via our 17.75 Meter Spider Lift and also with a hired in 18m boom lift – giving greater outreach than our spider lift. Both machines were operated by our IPF trained operatives. The teams access was also aided with the use of our own 8 mtr mobile access tower which is assembled by our PASMA trained crew. 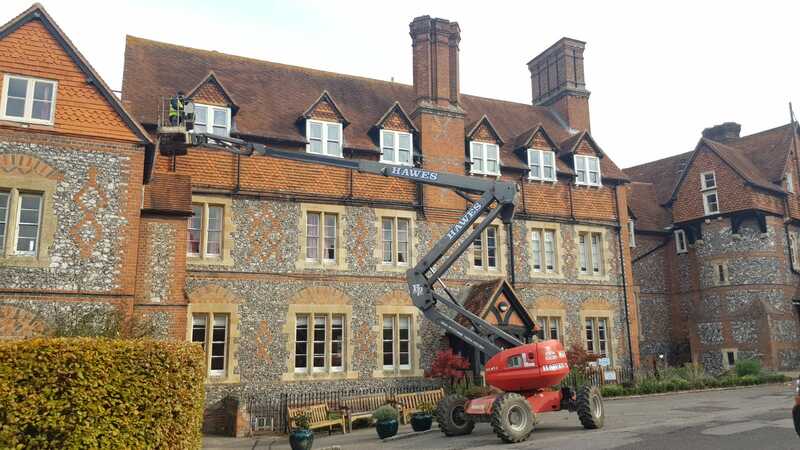 After 2 weeks on site our team had successfully cleaned gutters on 11 separate buildings, many of which had not had their gutters cleaned for up to 25 years! The 11 buildings varied in size with the highest gutter being around 11 meters high – our team even found a crashed drone in the gutters! Call today on 01494 355304 for the very best residential & commercial gutter cleaning service in Berkshire, the Home Counties & London.